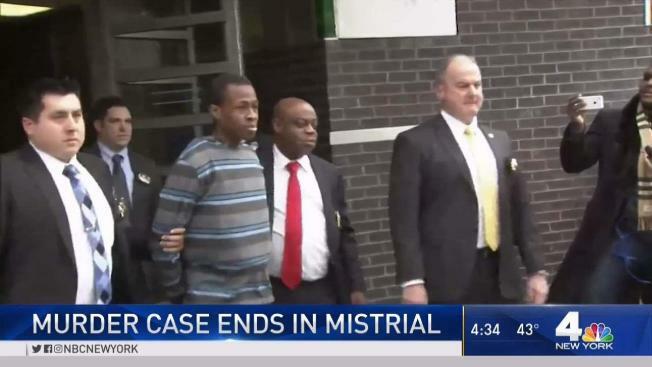 A hung jury mistrial has been declared in the case of a 22-year-old man accused of murdering a young woman when she went out for a run in her Queens neighborhood more than two years ago. A family member of Vetrano could be heard saying "Oh, my God" in the courtroom as the mistrial of Chanel Lewis was declared. Jurors said they were split and that it didn't seem as though they would make progress one way or another by deliberating any further. The judge agreed, saying that although it had been only a day and a half, it seemed as though the jury had exhausted all routes. Jury deliberations started Monday and continued into Tuesday night. The jury, comprised of seven and five men, asked to review evidence like pictures of Vetrano's neck injuries and a photo of her necklace, photos of the autopsy, photos of the running trail, and Lewis' web searches. They also asked to rewatch Lewis' confession tape. The judge read back 75-page testimony from the medical examiner regarding DNA evidence. A control hearing about what happens next is scheduled for Jan. 22. Lewis had pleaded not guilty to murder and sexual abuse charges in the Aug. 2, 2016 death of 30-year-old Karina Vetrano. He was 20 when he allegedly sexually assaulted and strangled Vetrano, abandoning her body in the marsh. Vetrano had gone out for her usual run early that evening. She never came home. Her father, Phil Vetrano, was among the group that found her body in Howard Beach's Spring Creek Park hours after she was reported missing. Phil Vetrano broke down on the stand as he testified about the horror. Lewis, who was 20 when he allegedly sexually assaulted and strangled Vetrano, was arrested in the killing about six months after her death. Prosecutors said he was connected to the case via DNA evidence obtained from underneath Vetrano's fingernails. The medical examiner had said she fought for her life. In a confession tape played during the trial last week, Lewis was heard saying he was angry about the loud music his neighbor had been playing when he encountered Vetrano jogging on the park trail. “While you were in the park, did something happen?” Assistant District Attorney Peter McCormack asks Lewis on the tape, which is dated Feb. 5, 2017. Lewis then admits that he “got angry and started hitting [Vetrano]” in the face and mouth, video shows. At some point during the attack, Vetrano’s tooth broke, he says, adding that Vetrano’s face ended up in a pool of water. Her clothing was “pulled off,” but Lewis denies sexually assaulting her. Lewis' defense lawyers claimed in closing arguments that a confession was obtained under duress and the evidence in the case was weak. They said the DNA found on the Vetrano's body was minuscule, and that police were eager to make an arrest six months after her body was found. "This is a rush to judgment," one of Lewis' lawyers said. The defense also claimed there was sloppy police work, starting with the crime scene when Vetrano's father lifted up and hugged her lifeless body when he found her. He broke down on the stand as he testified about the horror last week. The defense said because of that, "The crime scene became corrupted for the first time. You can't blame Mr. Vetrano for what he did. He did what any dad would do." They said the entire case was based on a rush to judgment and that prosecutors lacked the burden of proof.